October 8th, marks the 70th anniversary of a revolt by Jewish prisoners at Auschwitz-Birkenau, in which 60 Greek Jews are believed to have participated and died. The 1944 uprising was led by members of the Sonderkommando, so-called “special units” comprised predominantly of Jewish inmates whose tasks included the disposal of bodies who had been murdered by the Nazis in the gas chambers of the extermination camp. Sonderkommando members received special treatment and privileges in return for these compulsory duties. But because they had direct knowledge of the genocide being committed in the camp, they faced certain death as the Nazis followed a policy of gassing special unit members every four months and replacing them with new arrivals to the camps. The revolt on 7 October 1944 was launched by Sonderkommando members who were aware that their deaths were being scheduled. A few weeks before, some 200 of their number had been tricked into going to the gas chambers, where they were murdered. This left the remaining Sonderkommando teams even more anxious about their fate. Plans were set in train to smuggle gunpowder from a munitions factory that the SS operated within the Auschwitz complex to the Sonderkommandos, who worked at the crematoria. Using this gunpowder, Sonderkommando leaders hoped to destroy the gas chambers and crematoria, spark the uprising, and escape in the direction of the advancing Soviet army. In total, some 451 Sonderkommandos were killed by Nazis on the day of the rebellion, including several who briefly escaped from the death camp. 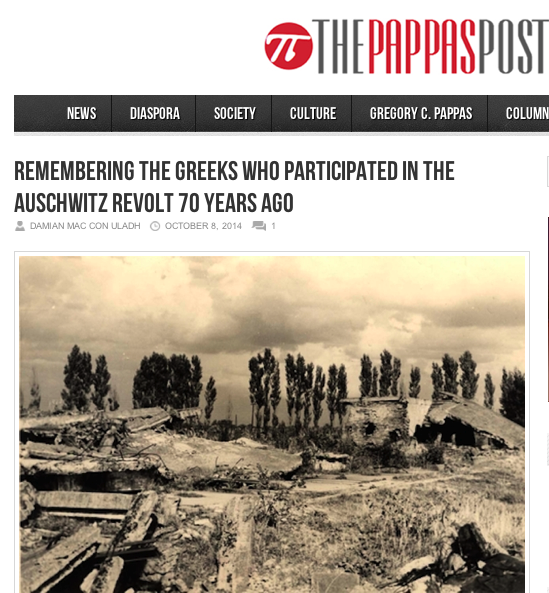 A 2009 publication by the Greek foreign ministry, entitled Greeks in Auschwitz-Birkenau, claims that 300 Greeks participated in the uprising, 26 of whom survived. The publication lists the names of 60 Greek Jews said to have been killed in the uprising.